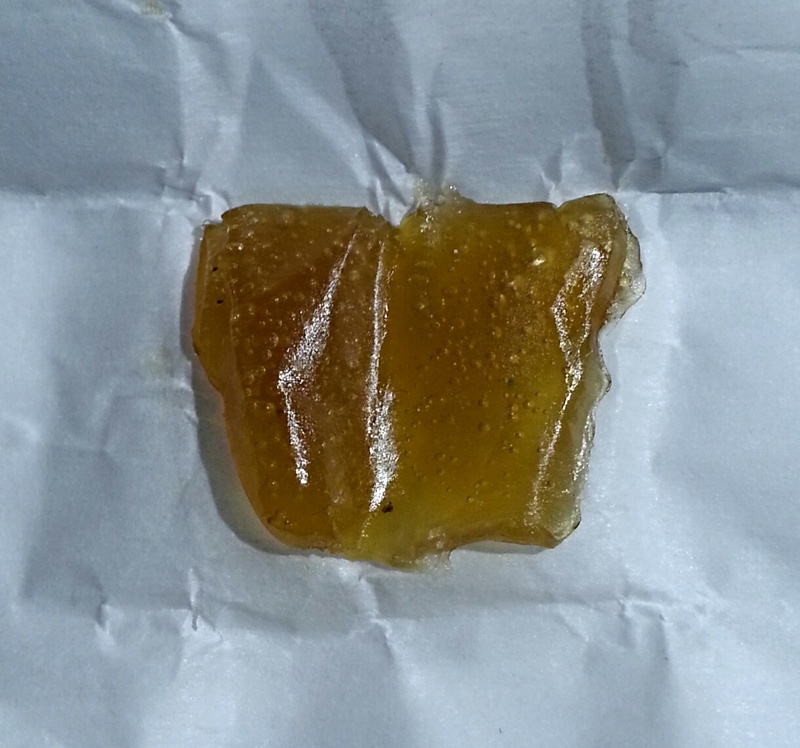 This sample of Green Dream shatter comes to us from HGH extractions, a multiple award winning LA based extraction company. Over the last few months, I’ve come to recognize HGH as the absolute leader in creating quality extractions. This concentrate is a BHO extract, which many people fear to be unhealthy. When done right, BHO extraction is safe. 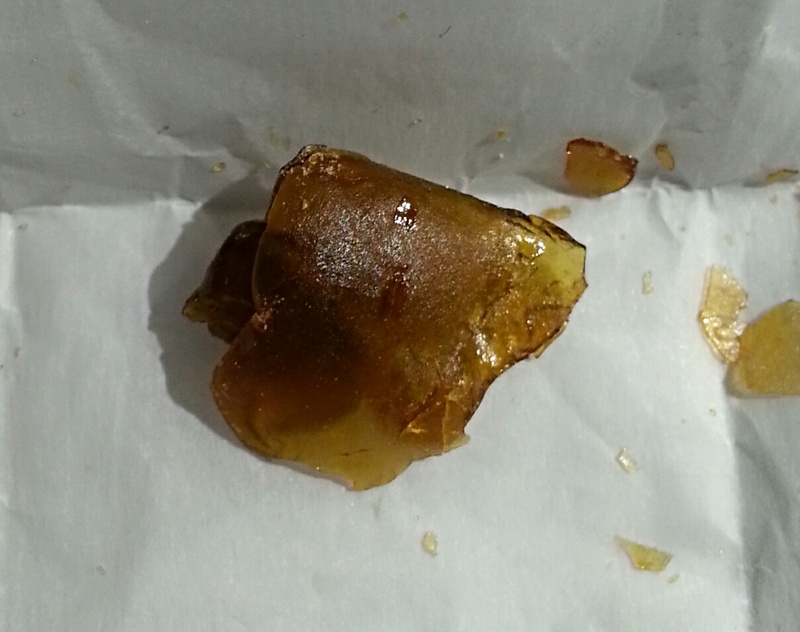 And this is shatter done right. Green Dream is a cross between two sativas: Green Crack and Blue Dream. I’ve also seen it on menus as Blue Crack. It is a well designed hybrid looking to capitalize on each parent’s dominating effects–both in taste and effect. When I first picked this up from Second Story, it was a real glass-like shatter. My half gram was made up of one big burnt-amber colored chunk and some smaller slivers and shards that had broken off it. When I got it home, it became soft and tacky in warm weather, and my office sits in our powerful Orange County afternoon sun. The longer I had it, the more the consistency changed to that of a wax, feeling soft and buttery. It became cloudier as well. The taste profile again is balanced between the two parent strains, combining Blue Dream’s dark berry flavor with the tropical sweetness of Green Crack. This strain hits at mach speed as a concentrate, and I felt the effects on the exhale. Blue Dream brings a spacey and creative high, that doesn’t hesitate to add relief and comfort to the body, too. Green Crack, on the other hand, can be energetic and productive sativa. Either late at night or in the early morning, this medicates like a cup of coffee. But relaxing, so with a little added whiskey for good measure. I found it to be all at once dreamy but engaging. It is much more clear headed than Blue Dream alone. More stoney than just Green Crack. Sadly, I only got a half gram this trip. If I knew the kind of high it spawned, I would have donated for more. Be sure to swing by Second Story and grab yours quick. It won’t last long. While wandering around the LA Cannabis Cup, I stumbled on a corner booth laden with row after row of vibrant gummy treats. Personally, I happen to be addicted to gummy anything, so my attention was caught. Sliding through the crowd, I concluded to take a closer look. They were selling C02 infused edibles from MediZen. I decided upon the California Apples, assuming with some sarcasm that they would taste like going to Oak Glen, California, to the apple farms. In truth, they were nothing more than the candies I used to get from the nickel candy shop down the street growing up–non-medicated, of course. 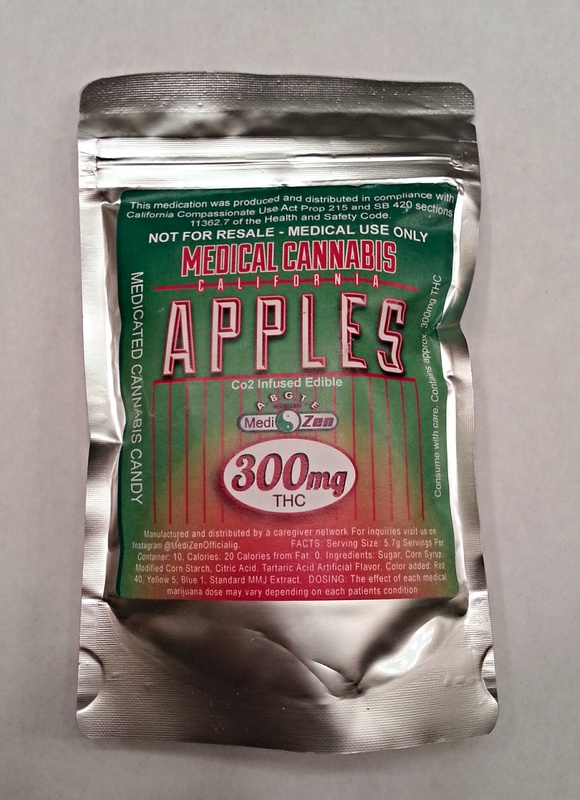 These little disks come in sour green and sweet red apple, and now there is a grown up version infused with what the packaging calls “Standard MMJ Extract”. They were a very soft and fresh edible, bursting with either a sweet Red Delicious or a slightly sour Granny Smith apple taste. A rich gummy treat, there was some lingering bitterness from the cannabis. Each package contains approximately 300 mg of THC. This makes for 20 mg each candy. Using smaller candies as the edible made for an incredibly variable medicating experience. I had total control and could use fewer or more sours to fine tune my medicating. I got three complete dosings of 100 mg. Even those I was able to spread out, by eating the candies two at a time at intervals throughout the work day. I experienced a body dominant high that manifested first in the neck and limbs. There wasn’t much in head or eyes, and I found psychosomatic effects to be minimal. This made for an effective respite from joint and muscle pain during work, when I couldn’t be too impaired. Although there was noticeable body relief, there was no couch lock at my doses. Instead it was a mellow and relaxing way to ease aches and soreness. A soothing and unwinding edible, it was also useful for anti-anxiety as well. I’ve seen comparable edibles with less THC and higher price points elsewhere in the OC. Instead, grab some of MediZen’s products and get more for less. Before I tried this strain, the only blue diamond I had ever seen was the famous Hope diamond kept at the Smithsonian, made blue by trace amounts of boron in its crystaline structure. Second Story’s Blue Diamond would be a completely different stone, as it were. And “hope”fully lacking in any boron. Blue Diamond is a cross between Diamond OG (OG Kush crossed with a pure indica) and Blue Dream. 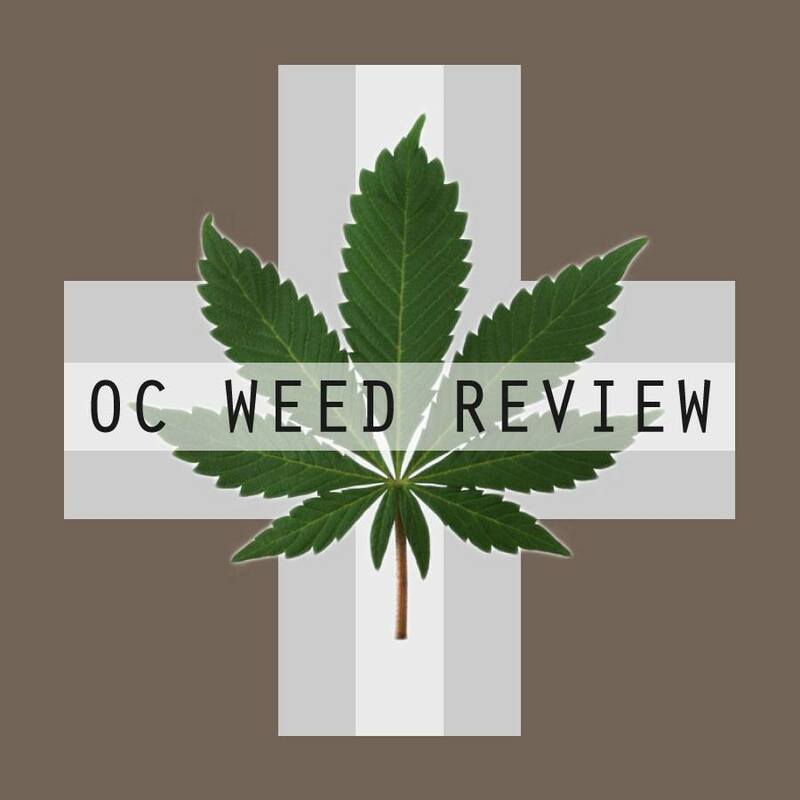 I’ve long been a fan of Blue Dream: just take a look at my review. Beyond its aesthetically pleasing look and its delectable smell and taste, I’ve always seen Blue Dream as the perfect mental health strain. All cares simply disappear after medicating. Diamond OG, however, is a totally new experience for me. Although I’ve seen plenty of OG Kush hybrids, one this indica dominant is usually outside of my preference, yet any friend of Blue Dream is a friend of mine. I found the taste to be predominantly piney and nutty from the Diamond OG. The Blue Dream also lends a dark berry and lightly floral flavor. The vapor was sometimes harsh in the throat when the coil in my Cloud pen was real hot. Otherwise, there is an earthy sweetness that seems to temper the vapor. This concentrate isn’t really a nectar. It’s more like a taffy, light honey in color. It is very pale, almost white, and absolutely glimmers under the lights. While I was thankful it was stored on parchment paper, it was also put into far too small a container and was pressed quite tightly when sealed. When it got hot and then cold these last few days and nights, the consistency turned to a hard rock. Some oil seems to have been pressed out by the heat and pressure, but this had no effect on the potency. I eventually moved it to my Oil Slick jar, now that it was drier. The high offered hazy anti-anxiety relief from the Blue Dream. It was also good for depression, thanks to the dissociative effect. OG Kush brings a great mellow high, sneaking its way in through the Diamond OG. There was quite the significant indica high from Diamond OG: relaxed and body dominant. I felt it first in the arms and legs, then across the back and shoulders. Blue Diamond offered nice headache relief. Although at times I had tired eyes, I experienced no lock and remained active while medicating. I became tired at night, which may go without saying, but the Diamond OG certainly helps with unwinding before bed. On the nights I had the hardest time sleeping, it didn’t cure my insomnia, and I had to resort to a pure indica to get the job done. This indica dominant hybrid is a mix of G-13 x Hash Plant. Named Mr Nice, it was established in honor of famed author and pot smuggler Howard Marks. While not judging him personally, Mr. Nice was just one of many aliases Marks took, and not a compliment to his benevolence. This particular moniker came after he bought the passport of convicted murderer Donald Nice. Marks was eventually convicted of his involvement in the moving of drugs, and since completing his sentence, he continues to write and conduct lecture tours. The flowers of this harvest are pretty thin and stringy. There is a purple hue to the buds, especially at the tips, and the greenery comes mostly from leaves. Deep brown hairs cover the nuggets in bushy chunks. Overall, each bud was kind of stemmy and were thin fingers of a bud. Not to be counted out though, the flowers were sparkly under LEDs and a bit sticky from the Hash Plant influence, alluding to a hidden potency. Mr. Nice Guy has a complicated palate, helped nothing by the variety of its phenotypes. The first impression is of funky earth and sweetness. I’d possibly describe it like wet ground and tropical flower. There is also a possible purp terp scent of over-ripe or rotten berry in play. There are other smells too: burnt oak ash; a mildewy basement or wet leather; dense resinous wood. There is also a musky spice that is difficult to pin down. Yet so familiar. I’d say it has a manly scent–a dirty gruffness. This taste complexity comes from the Hash Plant. Some simply call it a hashy scent, but that’s a bit of a cop out. The smoke tastes just as layered as it smells. The pungent berry and musk are most evident, but that indescribable spice is there as well. An indica dominant hybrid, I expected a real stoney high. However, it had a pleasant groovy nature to it, making it work as a daytime indica. I caught some super red eyes, which made me look more medicated than I was. Mr. Nice Guy was clear headed overall, and I found it pretty helpful to work under its use. It gave me a nice body high without the inhibiting psychedelic effects. This is the effect of the G-13, aimed to maximize usefulness as medicine and minimizing intoxication. Watch as the Hash Plant wants to work against this though. And at larger doses, it will. Regardless of the potency of your harvest, be sure to respect this strain, lest it bowl you over. Seeing this bar in my local dispensary was quite a blast from the past, since Pop Rocks were a large part of my childhood. I had to take this edible home, if for nothing more than the nostalgia, and I couldn’t wait to try it. Because we all know that Pop Rocks mixed with soda will make your stomach explode, I decided to take this snack to the local coffeehouse to wash it down with a latte. The first bite off the bar erupted in my mouth. It was like eating a Krackle bar that wouldn’t stop krackling, as the candies popped their way across my tongue. Mixed in with this tactile experience was a nice dark chocolate taste, whose bitterness mixed with the cannabis bite to mask it. The whole candy bar has just four ingredients: dark chocolate, popping candy, corn syrup, and cannabis. This shows a simplicity in this complicated world that I can respect. The serving sizes per dose are small, which is good if you are watching your sugar and calorie intake. A single segment is only 25 calories, meaning there are more mgs of THC per piece than calories. Each bar contains 180 mg of THC total from 4.2 grams of dried cannabis. I intended on eating a third of the bar, a 60 mg dose. However, I broke off an extra piece in my mouth and medicated with half the bar. Whoops! Though a 90 mg edible is hardly unheard of, it was more than was needed from this effective edible. The 4.20 Bar has a real easy come on. It was hardly noticeable, until suddenly it was there. The high started soft in the joints, which was followed shortly by an uplifting, pleasant mood. I hate the not-really-a-word word melty. But this edible’s high is physically melty. Only an invented word can describe it. It also heightened the senses, making everything enjoyable, and offered great visual and aural effects. My skin absolutely came alive. It was a bit locky. I ate my half and slowly lost the will to work as it kicked in. Not that I’m complaining. I spent several moments enjoying open eye visuals as the the sun played off a fountain near by. I’ve been rush, rush, rushing lately for my many jobs and responsibilities. Even my free time, as infrequent as it came along, was invaded by thoughts of what needed to be done. It was a dear euphoria to find myself drifting off in a daydream with not a single thought on my mind. In today’s world, who doesn’t need this every once in a while. There was a glow about the high that rubbed off on everyone I came in contact with. For pain sufferers, don’t think your relief is ignored with the high THC count. There is just enough CBD and CBN to encourage physical wellbeing, too. Regardless of your medicating needs, The Venice Cookie Company has got you covered. When I was in my graduate program we used to drink a shot called the Lemon Drop. Vodka was shaken over ice and then strained. The shots were chased by biting on a sugared lemon. I used to love them. Citrusy sweet, and slightly sour. While browsing through OCPC’s waxes this week, I was looking for something more glassy. I’ve just had a real dry Blue Dream wax that was troubling to use in my pen, so I was looking for something that would vaporize easier. 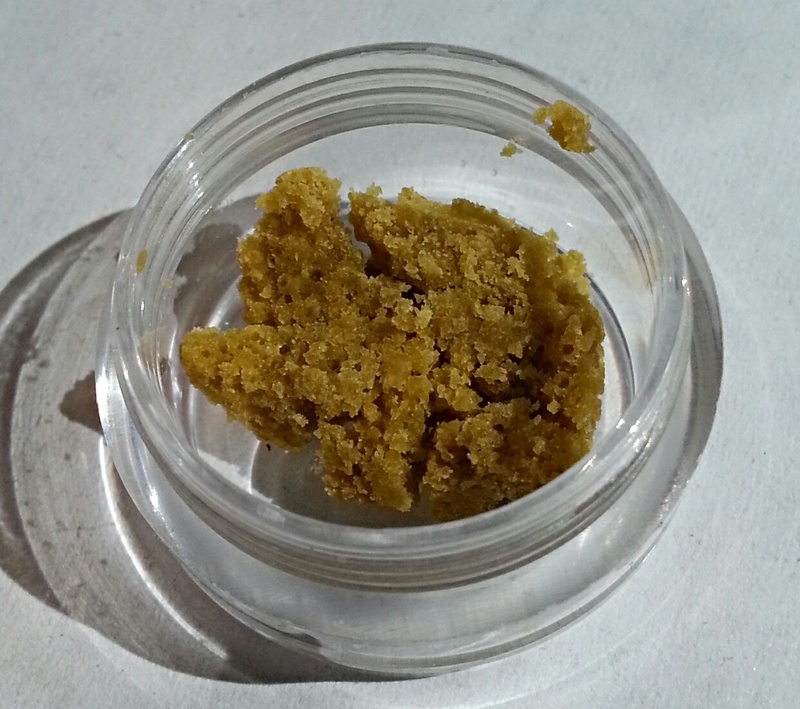 However, hidden behind a stack of darker budders, I saw this golden gram of Lemon Drop wax and decided to take it home. I’m a sucker for the Limonene terpene that gives some strains their lemony flavor, and I was hoping to get a big dose with this donation. This Lemon Drop wax melted well in my Cloud Pen, if not a bit slow. I had to make sure to get it right down on the heating coil to get a full hit. Although it was wetter than some waxes, I still ended with crumbles in my Oil Slick jar when breaking pieces off the rather sizeable 1g moonstone I picked out. Like clay from a cave, it was pliable but grainy. Having a light brown color, it wasn’t the purest of waxes I’ve seen, but it was clearly free of most particulates. There was a nice and sweet lemon scent, similar to Super Lemon Haze, but less aromatic than a well cured flower. The vapor is thin, and so is the taste, both of which were a disappointment. However, it hits heavy to the cheeks and forehead when it does finally heat up enough to vape well. I had lazy, drooping eyes that made me look higher than I was. Lemon Drop was actually quite clear headed and creative in low doses. But giggly and euphoric during longer sessions. The medication seems to lean sativa, but it is clearly a sativa/indica hybrid. It offered a two part high. While there was good tension relief in the head and neck and I found it effective for migraines, Lemon drop also worked well for stress and anxiety relief. The relaxing of both the mind and body is perfect to make it through your tougher days at the office. What?! Jack Herer and OG Kush are available in a single hybrid. Like peanut butter and chocolate. Like peanut butter and jelly. Or crackers. Or celery. When you think about it, peanut butter and just about anything. These two strains were practically made for each other, and now they are together at last. These buds have tons of orange/brown hairs and rich amber trichromes. Beneath this lies lime green flower and some dark green leaf. It is an aesthetically gorgeous strain, very earthy, with all the colors of the forest. The scent is also woody and pine, dominant profiles in both parent strains. There is a faint sour skunk, but it is an afterthought. Overall, Jack and OG come together to create a delightfully spicy and exotic smoke. Like incense, the smell is alluring. The taste is equally earthy. The green hit is a rush of resinous pine wood and bark spice, like vanilla or saffron. After smoking this hybrid, I was all smiles and creativity. There are really two separate highs going on here: OG Kush’s mellow, no cares attitude and Jack’s clearheaded productivity. Just like any other sativa dominant, it is a great daytime high. From wake n’ bake to sundown, and even into a night out on the town, Jack Herer and OG Kush will work together to ease your anxiety, whatever its source, and will even lift your mood. For patients looking for complete psychosomatic relief, this could be your strain.